FEI Secretary-General Sabrina Ibanez with Ground Jury President Jean-Pierre Allegret, right, and Technical Delegate Rui Amante. Scenes of confusion reigned at the ride base of the World Endurance Championship in North Carolina today, after some riders were misdirected on the first loop. A video posted online by a 4* judge Ahmed Al Hammadi, from the United Arab Emirates, gave a strong sense of the drama that unfolded as officials sought to find a solution to the problem. The remarkable call to void the first 40km loop and effectively stage the world championship over the remaining 120km of the course is unprecedented and controversial. It may well prove open to legal challenge, although a statement by World Equestrian Games officials cited a section of the FEI’s endurance rules that allowed race officials to make a decision in a sporting spirit in unforseen or exceptional circumstances to meet the overall intention of the rules. There are already calls for the race to be re-staged elsewhere, although that may well prove difficult for those who had to meet their own costs to attend the Games in Tryon. The misdirection led to some riders heading back toward the vetgate, and others covering an extra 5km. Al Hammadi’s video of events at the ride base shows a series of heated discussions, amid accusations that the FEI was interfering in the role of the ground jury, which was apparently meeting nearby as the video was being taken in a bid to find a way forward. 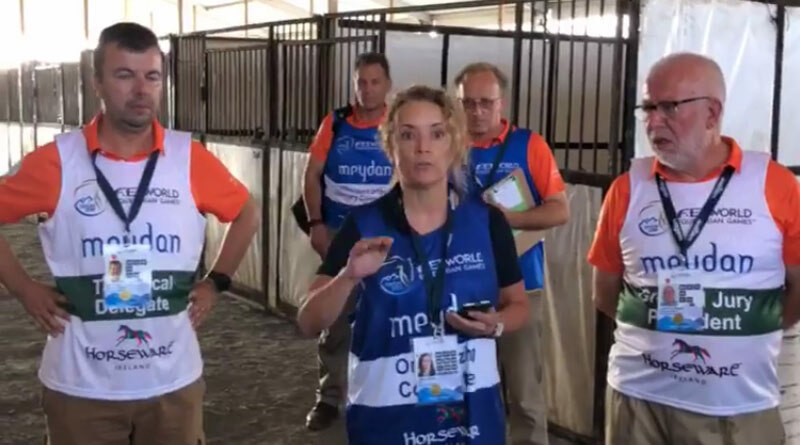 The video shows FEI secretary General Sabrina Ibanez, speaking on behalf of the ground jury president, explaining that there was a misdirection. The event, she said, could not be rescheduled. After exploring different options, the ground jury had decided that all horses would complete the loop one vet check, then restart in what would effectively become a 120km race. It was, she said, a new race. A statement released by the organisers said: “As some teams were unfortunately misdirected at the start of today’s endurance ride, the competition will be stopped at the first vet gate and re-started as a 120km championship. “In order to ensure that all horses are fit to compete they will all go through the vet check. Only horses that have passed the vet check will be allowed to compete. No substitution of horses will be allowed. “The restart of the ride will take place 45 minutes after the last horse has been inspected at the vet gate. “As there is no possibility to reschedule the ride tomorrow, the President of the Ground Jury, President of the Veterinary Commission, Foreign Veterinary Delegate and the Organizing Committee agreed that this was the only pragmatic solution.